When you begin Magma Blaster, you'll see a volcano in the center of the screen and Tyrannian citizens walking back and forth at the base of it. Rocks will begin to be hurled from the top of the volcano and if not destroyed, will land on the Tyrannians below. To destroy the rocks, you will need to aim at them using your mouse and fire your laser with left click. There are six different types of rocks and each type must be destroyed by a different laser, which are selected with the number keys (more on that in a moment). There are five levels in the game, each introducing a new type of rock and requiring you to destroy a certain number of rocks to proceed. Scoring above a certain amount of points on each level can also unlock bonus levels where instead of having a limited number of rocks you need to shoot, you're given 15 seconds to shoot as many rocks as you can. If you miss a rock in any of the levels and it lands on one of the Tyrannian citizens, you will lose a life. Your total lives are equal to the number of Tyrannians still running around the volcano; losing them all means losing the game. If a missed rock lands on the ground without hitting a Tyrannian, you won't lose a life, though you shouldn't expect rocks to miss often. To change which laser you're using, press the number key between 1 and 6 which corresponds to the rock you are attempting to destroy. The HUD at the bottom of the screen shows which types of lasers you can choose from and which one you currently have selected. The rock inside your cursor's crosshairs will also change to match the currently selected laser. 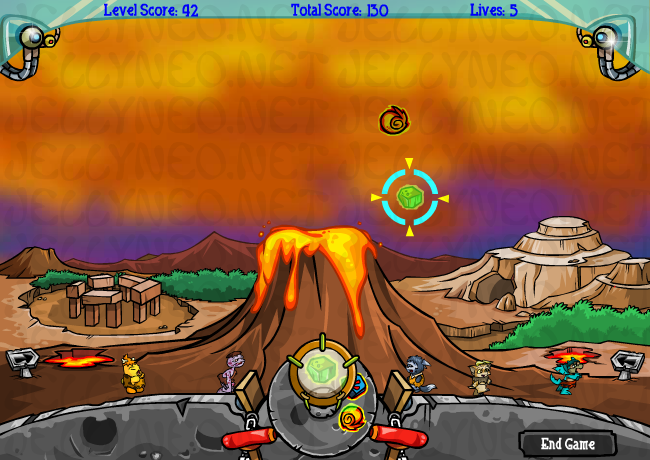 Points are earned in Magma Blaster for every rock you destroy. If you manage to shoot a falling rock while the majority of it is inside the crosshair's rock, you will be awarded 4 points. If you shoot a rock while only a little of it is inside the crosshair's rock, you'll receive only 2 points, but the rock will still be destroyed. These are the only two ways to earn points in the game, so racking up a high score just means shooting a lot of rocks. Each level has a fixed number of rocks that need to be destroyed, which means there's a fixed maximum amount of points that can be earned in each level. Although, because the level doesn't end until you destroy all the required rocks and there are no rocks left on screen, it's possible to get a few extra points. If you destroy the final required rock while it's close to the ground, this will give time for one or two more rocks to spawn before the next level. If you manage to score the maximum number of points from the required rocks, you'll unlock a bonus level. Bonus levels spawn a random number of rocks in a short time frame, so you'll sometimes score higher or lower in these rounds depending on how lucky you are. Magma Blaster is a pretty simple game, it's mainly just point and click. The two aspects of the game you'll want to practice are selecting the correct rock laser and consistently landing good shots on rocks for the most points. You may at first use just use your index and middle fingers to press the number keys, which is fine for first few levels, but once you have five or six different lasers to select, it can become impractical. For at least the last few levels of the game, you should use your ring finger for keys 1 and 2, middle finger for 3 and 4 and index finger for 5 and 6. Keeping your fingers in these areas means not having to move a finger across multiple keys creating a greater chance of pressing the wrong one. As for consistently landing good shots on the rocks, the trick is to shoot the rocks at the peak of the arc they are launched at. This is the point where the rocks slow down and spend the most time in one spot, making it really easy to line up the shot. If a rock falls to the ground, but doesn't hit a Tyrannian citizen, you won't lose a life!